MARRIAGESAt Bosbury, Herefordshire, Mr. John Winnall, of Brace’s Leigh, Worcestershire, to Miss Stone, daughter of the late Mr. James Stone, of Temple Court, Bosbury. MARRIAGESOn Thursday at Bosbury, Mr.P.Ballard of Felton, to Ann Elizabeth, youngest daughter of Mr. Drew of the Grange, all in Herefordshire. On Thursday last was married, at Bosbury, in this county, Mr. Thomas Kendrick, of Ashperton, to Miss Sarah Turbevill, of the former place. MARRIED. On Monday, at Bosbury, by the Rev. J. Lodge, Mr. Wm. Acton, of Hay, Breconshire, to Melina, second daughter of the late Mr. Jas. Hartland, of Temple Court, Bosbury, Herefordshire. MARRIAGE On Wednesday the 18th inst. was married, at Bosbury, Herefordshire, by the Rev. J.Hebden, Mr. Joseph Heaford, merchant of Odessa, to Sarah Elizabeth Jackson, daughter of the late J. Jackson Esq, of Upper Canada, British America. On Monday last was married, at Bosbury in this county, Mr. James Bettington, of that place, to Miss Mary Barrett, neice to James Barrett, Esq. of Powis Court, in this county. Same day [Thursday last], at Bosbury, by the Rev. Dr. Taylor, the Rev. Charles Taylor, Master of the Hereford Grammar School, to Miss Mary Sill, sister to the Rev. J. P. Sill of Bosbury. The Oxford Journal of 14th July says that Mary was the youngest daughter of Rev. H. Sill of Bosbury. On Thursday last was married, by the Rev. Chas. Brown, at St. Sidwell’s, Exeter, the Rev. John Hanmer Underwood, Vicar of Bosbury, second son of the Rev. Thomas Underwood, Canon Residentiary of Hereford, to Harriet, youngest daughter of the late Major Dowell, Southhall House, Exeter, formerly of the H.E.I.C. service. May 14, at Bosbury, by the Rev. J. H. Underwood, Vicar, Mr. Wm. Dutton, engineer and whitesmith, Hereford, to Miss Ann Bishop of Bosbury. April 24, at Bosbury, by the Rev. J. H. Underwood, Mr. Richard Barrell, of the parish of St. Weonards, to Miss Turner, Lower House, in the parish of Bosbury, both in this county. Sept.23, at Bosbury, by the Rev. J. H. Underwood, Vicar, Mr. Thomas Morris, Dodds Mill, miller, to Miss Mary Julf, niece of Mr. Thomas Drinkwater, Bell Inn, both Bosbury. Sept. 23. at the parish church of Bosbury, by the Rev. J. H. Underwood, Vicar, Mr. Thomas Gatfield, Swinmore, widower, to Miss [Jane] Phillips, of Catley Cross Farm, both of Bosbury. Mary Jelf in the Parish Register. Nov. 24, Mr. John Cotton, of the Woodhouse farm, near Ledbury, to Maria, second daughter of Mr. Richard Kendrick, late of the Townend, Bosbury, Herefordshire. Dec 17, at the parish church of Bosbury, by the Rev. J. H. Underwood, Vicar, Mr. D. Mc.Cann, of Great Malvern, widower, mason, to Miss [Ann] Thomas of Catley Court, Bosbury. Sept. 24th, at Colwall Church, by the Rev. F. Custance, Mr. Thomas Pitt, of Bosbury, to Mary, youngest daughter of the late Mr. John Harford, of Colwall, Herefordshire. June 21st, at Bosbury, by the Rev. J. H. Underwood, vicar, Mr Joseph Gardiner, widower, Paddals Farm, to Mrs. Mary Lane, spinster, domestic to the Rev. E. Higgins, Bosbury House. Oct. 12th, at Acton Beauchamp, by the Rev. W. Cowpland, Mr. Edward Browne, Bosbury, son of the late Edward Browne, Esq., Bromtrees Hall, to Elizabeth, fourth daughter of the late Mr. James Pudge, Halfridge, Acton Beauchamp. DAUGHTER OF THE REV. EDWARD HIGGINS, OF BOSBURY HOUSE. There are historical reminiscences connected with the village of Bosbury, which render it at all seasons an object of interest to the tourist, the antiquarian, and the lover of the beautiful in nature and graceful in art. But never did the village, or town (for a town it unquestionably has been), present a more genial aspect to arrest the gaze of all than it did on the morning of 30th of September . The day has become celebrated by an event which had for some previous months been looked forward to with anxious expectations. The anticipations of the young, the middle-aged, and old, were to be realised, and with warm hearts and sincere desires for the happiness of the youthful pair, a large party of persons assembled on occasion of the marriage of Miss Ellen Gray, the only child and accomplished daughter of the Rev. Edward Higgins, of Bosbury House, to Robert Baskerville Rickards Mynors, Esq. of Treago, St. Weonard’s in this county. The aromatic hop, the grape of the county. Lifts its full clusters of paler green. the principal inhabitants and humbler inhabitants in the “twinkling of an eye” filling the church. The bride, who was given away by her father, was attired in a rich white glacé silk dress with two superb lace flounces; on her head she wore a wreath of orange flowers and white roses, over which was thrown a costly lace veil descending to her feet. The bridesmaids, who wore white tarlatan dresses with elaborately embroidered mantles of maize-coloured silk, and white transparent bonnets with wreaths of maroon velvet, were – Miss King, Miss Anna Maria Hopton, Miss Mynors, Miss Mary Cave, Miss Diana Hopton, Miss Olivia Cave, and Miss E. King. At the conclusion of the ceremony the distinguished party returned to Bosbury House, where an elegant déjeuner was prepared under the direction of Mr. Hambler, of Worcester. On leaving the church the cheering of the crowd was enthusiastic, and blessings upon blessings, with fervent aspirations for the future health and happiness of the newly-wedded pair, fell from the lips of all. The cottagers and working-people had cause to remember the day; bountiful cuttings of beef were doled out to them the day before, so that, when the dinner hour came, they had additional motive for mingling their congratulations with those of their wealthier neighbours, while partaking of the hospitable treat of the Rev. proprietor of Bosbury House. The children of the school were regaled with tea and plum-cake in the evening; and in short, nothing was wanting to make the day what it will continue to be – a “red-letter day” in the village annals. The youthful and happy pair, bearing with them the fondest wishes of all, left the mansion at three o’clock on their route into North Wales. As they passed through the village the assembled villagers and tenantry loudly applauded, and the usual excellent order and decorum which marks the spot was duly observed throughout the day. Everything passed off so admirably that all wished the day’s triumph had been longer-lived. The weather was cheering, and rendered doubly acceptable as the two previous days had been very rainy – may it be a prognostication of future sunshine and happiness to the bride and bridegroom. April 7th, at Bosbury, Mr. Thomas Pritchard, currier, &c, youngest son of Mr. T. Pritchard, tanner, of Hereford, to Sarah Ann, only daughter of Mr. Edward Bury, Swinmoor Farm, Bosbury. July 30th, at Bosbury, by the Rev. R. Stanhope, vicar, Mr. J. C. Blacklock, of Montreal, Canada East, to Louisa, third daughter of Mr. W. Pitt, Temple Court, Bosbury. MARRIAGES On the 27th at Hope-under-Dinmore, the Rev. Berkeley Lionel Scudamore Stanhope, M.A., Vicar of Bosbury, third son of Sir Edwyn Scudamore Stanhope, Bart., of Holme Lacey, Herefordshire, to Caroline Sarah, eldest daughter of John Arkwright, Esq., of Hampton Court, in the same county. MARRIAGES Jan. 26, at Bosbury Church, by the Rev. B. L. Stanhope, M.A., vicar, assisted by the Rev. William Edward Best B.A., Mr. William Harrington, of the Millend, Castle Froome, to Mary Anne, fourth daughter of Mr. William Pitt, of Temple Court, Bosbury. MARRIAGES Feb. 16, at Bosbury, Herefordshire, by the Rev. W. E. Best, Mr. James Pudge, of the Morend Farm, Ashperton, to Jane, eldest daughter of Mr. William Vobe, Hill-park, Bosbury. On the 28th ult., at Bosbury, Herefordshire, (by the Rev. H. Shuker, assisted by the Rev. B. L. Stanhope,) Matthew Edward Hiatt, Esq., of Staplow House, youngest son of John Hiatt, Esq., of the Merribles, Gloucestershire, to Mary, eldest daughter of Richard Hickman, Esq., of the Old Court, Bosbury. WEDDING FESTIVITIES.—On Thursday last this usually quiet village was quite thrown out of its equilibrium by the preparations made for celebrating the marriage of Mr. Thomas Hawkins of Hope End, Ledbury, with Miss Shayle, daughter of George Shayle, Esq., of Upleadon Court. The happy bridegroom as usual was the first to make an appearance. He was followed by five other carriages containing the friends and relatives of the happy pair. On entering the village “mine host” of the Crown, showed the wedding party his zeal by a most beautifully decorated arch, with the motto “Health and happiness”, while over his door was the very significant and gratifying motto, “The Roast beef of Old England.” Higher up the village another floral exhibition met the gaze. Mr. Thomas Gardiner from early hour had been making great exertions in the festive cause—a large and beautiful arch spanned the street in front of his house with the motto “May happiness attend you” on one side and “Long live the happy pair” on the other. At the church porch was the motto “God bless the bride.” As the weather was damp, Mr. T. Gardiner placed a long line of carpeting from the road to the church door. But “Hush, here they are!” 0ne, two, three, six carriages. Last of all, supported by her father came the beautiful and blushing “bride.” She was observed of all observers. And well did she merit such observation. Her dress consisted of a white glace silk dress, tulle veil, and the indispensable wreath of orange blossoms. The bridesmaids, four in number, were dressed in scarlet mantles with white dresses, white tulle bonnets and scarlet boots. The knot was tied by the Rev. Berkeley Stanhope, vicar. Comes she, ’mongst the happy, the most blest, along. Round the rose of affection that blooms in her heart. And now of course, the two being made one, the motto before referred to, began to be discussed, viz., “the Roast beef of Old England,”, this in fact being the usual wind up of all Old England’'s festivities. At the residence of the father, the tradesmen, labourers, &c., were amply provided for, while the ringers and several or the aged poor were catered for by host Brazier of the Crown, Mr. Gardiner being busily engaged as master of the ceremonies. At three o’clock the happy duo passed through the village en route for London to spend the honeymoon. PITT—GRIFFIN. Oct. 4, the parish church of Hartlebury, by the Rev. T. Baker, John Harford Pitt, Free Town, Stoke Edith, Herefordshire, to Elizabeth Maria, youngest daughter of Mr. George Griffin, Torton. LANE–MAYO.– On the 2nd inst., at the Church of the Holy Cross, Avening, near Nailsworth, by the Rev. Gilbert Scott, William Scott, William Sivell Lane, the Farm, Rosbury [sic]}, to Elizabeth, widow of T. E. Mayo, High-street, Ledbury. The marriage took place on Saturday, last, at the Parish Church, Bosbury, by the Rev Burges Bayley, vicar, assisted by the Rev Edward Davies, Cefn (cousin of the bride), between Miss Mary Amelia Pudge, daughter of Mr H J Pudge, 11 Note House, Bosbury, Herefordshire, and Mr Stephen Vaughan Davies, Coronation Stores, Lampeter. The bride, who was given away by her father, was beautifully dressed in white satin, draped with old Brussels lace and trimmed with orange blossoms and diamond stars. She also wore a large white hat, trimmed with ostrich feathers. She carried a beautiful bouquet. The bridesmaids were Misses Beata Pudge and Lily Pudge (sisters of the bride) and Misses Annie M Davies and Maggie Jones (nieces of the bridegroom), who were dressed in terra cotta cloth costumes, the two former wearing large black picture hats trimmed with plumes, the latter white beaver hats. They also carried bouquets, the gift of Mr Acock, Malvern, and wore gold bangles, gifts of the bridegroom. The best man was Mr D A Fox, Old Bank, Lampeter. The service in the church was fully choral, and when the wedding party were leaving the church the bells of the church were rung. The church, during the ceremony, was crowded with friends and relatives. After the ceremony, a reception was held at the bride’s father’s house, when a large number of guests assembled. In the Welsh Gazette and West Wales Advertiser of 1st January, it says that the Rev Edward Davies was cousin of the bridegroom, this probably being correct, and that the reception was held at the bride’s home, Note House, Bosbury. 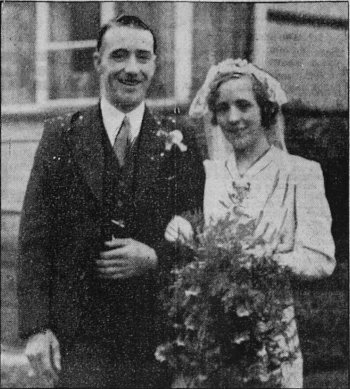 A very pretty wedding was solemnised on Thursday morning at Highbury Congregational Church, Cheltenham, when Miss Edythe Lance married Mr. Sivell Lane, of Bosbury, Herefordshire. The bride, who is the youngest daughter of the Rev. and Mrs. Wm. Lance, of Charlton Kings, was charmingly dressed in an Oriental satin gown, trimmed with Honiton lace. The bridegroom who is an old county cricketer, was attired in white flannels, and the idea was certainly a success. After the ceremony a few friends congregated at the King’s-hall, North-street, to drink the health of the bride and bridegroom, who left by the 1.18 train for Weston-super-Mare for the honeymoon. Mr and Mrs. S. Lane will reside at Staplow, near Bosbury. The marriage took place quietly at Bosbury Parish Church yesterday morning of Dr. Alfred Golland, M.R.C.S.,L.R.C.P. Holly Mount, Bosbury, and Miss Kathleen Howard Rogers, youngest daughter of the late Mr. and Mrs. Cecil M. Rogers, Nakuru, East Africa. The ceremony was conducted by the Vicar (Rev. Hugh K. L. Mathews). The bride was attired in a brown ring velvet dress, with brown hat and shoes and stockings to match, and she was given away Mr. Julius Stagg, The Castle. Munsley. There were no bridesmaids, and after the servioe the newly-married pair left for Malvern, en route for London and the South of France, where the honeymoon is to be spent. Dr. and Mrs. Golland’s future home will be at Holly Mount, Bosbury. Two well-known farming families were united by the wedding, which took place at Bosbury Church, between Mr. James Ward, second son of Mrs. Ward and the late Mr. J. H. Ward, of Woofields Farm, Coddington. and Miss Marion Turner, only daughter of Mr. and Mrs. R. J. Turner, of Catley Court, Bosbury. The officiating clergy, the Rev. H. K. L. Matthews (Vicar) and the Rev. E. J. Roberts (Vicar of Castle Frome) with the choir, met the bride on her arrival at the church porch escorted by her brother, Mr. Bob Turner, who gave her away. The service was choral and the organist (Mr. A. N. Jones) played the Bridal March from “Tannhauser” (Wagner) and Mendelssohn’s “Wedding March” as the bridal party left the church. The bride was a charming figure in a cream satin brocade dress cut on simple lines. She wore an embroidered veil with headdress of orange blossom and white satin shoes. Her shower bouquet was composed of orchids, white heather and fern. She was attended by a retinue of four bridesmaids. The two elder bridesmaids, Miss Elsie Ward (the bridegroom’s sister) and Miss Irene Hill, wore blue taffeta dresses with blue and silver headdresses and silver shoes. The two little bridesmaids, Misses Mary and Betty Mellins (cousins of the bridegroom) were prettily attired in white organdie, with blue sashes and sequin mob caps. The four bridesmaids carried bouquets of deep pink chrysanthemums, white heather and fern. The duties of best man were carried out by Mr. James Williams. After the ceremony a reception, attended by 60 guests, was held at the bride’s home. The honeymoon is being spent in Surrey, the bride travelling in a petrol-blue coat and hat, with navy dress, shoes, gloves. and fox fur. Mr. and Mrs Ward were the recipients of upwards of 100 wedding presents, including a tea service from members of the Castle Frome Women’s Institute, of which the bride had been a committee member for the past three years. The bridegroom gave his bride a gold wristlet watch and the bride’s present to the bridegroom was a watch and chain. The elder bridesmaids received pearl necklaces and the child attendants posy brooches. The ceremony was attended by a large congregation. SHEPPARD-CARVER — On August 9. at Bosbury, Herefordshire, William, youngest son of Mr. and Mrs. Sheppard, of Coventry, to Beryl, youngest daughter of Mr. and Mrs. Carver, of Bosbury. B S Sharples Created: March 2015 Last Modified: December 2016.